The Santa Ana winds, blowing hot, dry air from the desert, accelerated the Cedar fire’s advance by throwing burning embers hundreds of feet. At one point the fire jumped 12 lanes of Interstate 15. It was so hot it melted asphalt. California’s fires are only getting worse, yet San Diego County is giving a proposed housing project an exception to fire code meant to ensure safe evacuation. Examining this code waiver and what it could mean for my family during the next wildfire. West of the city of Escondido and south of San Marcos is the small, rural community of Harmony Grove. Bordered by the Elfin Forest Recreational Reserve and Del Dios Highlands Preserve, hikers can look down on the chaparral covered hills that surround the valley and its existing homes. Rated a Very High Fire Hazard Severity Zone by CAL FIRE, since 1980 there have been 19 wildfires within three miles of the valley. Meaning, Harmony Grove should expect to be threatened by a wildfire every 2 years on average. Santa Ana wind driven fires typically begin east of the area and travel through Harmony Grove, to threaten Elfin Forest, San Marcos, Encinitas, Escondido, Carlsbad, Rancho Santa Fe, and other communities nearby. Eleven homes and 25 structures in Harmony Grove were completely destroyed in 2014’s Cocos Fire. The approach of the Cocos Fire in 2014 from Harmony Grove. 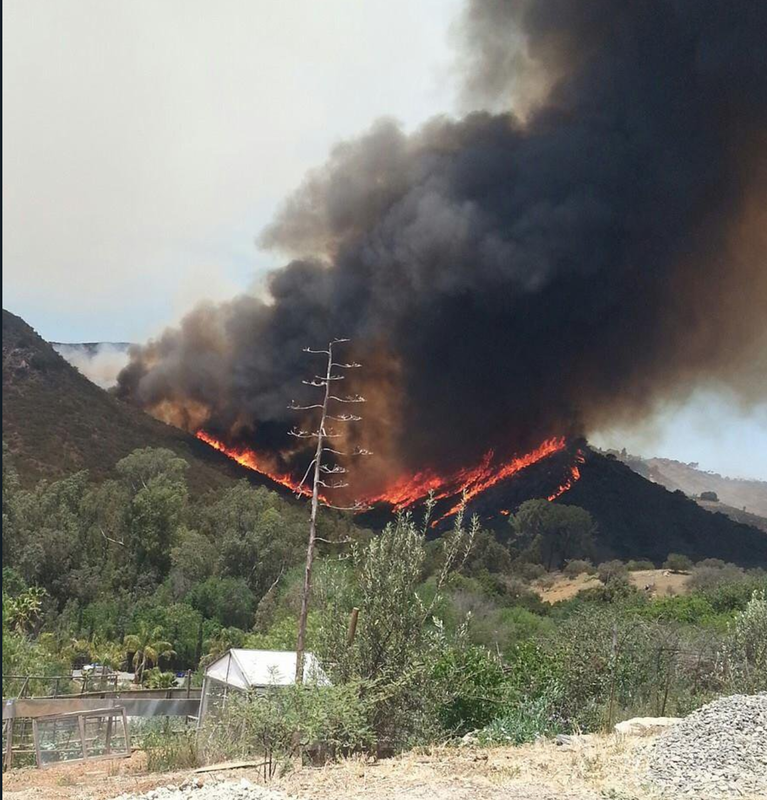 What started as a small brush fire on a hillside behind Cal State San Marcos exploded into a 2,520-acre wildfire that destroyed 11 single-family homes and 25 structures in Harmony Grove. My grandparents built their home in Harmony Grove in 1967. The home survived the Del Dios Fire of 1997, although everything else on the property burned. The house itself only remained standing because after the firestorm passed, my grandfather, father, and two of his brothers, were able to run back up the hill and put out the fires burning on the deck and the roof. Escondido Creek, which begins above Lake Wohlford, trends southwesterly through the community, eventually flowing into the San Elijo Lagoon. The main roads are Country Club Drive and Harmony Grove Rd, two-lane country roads that are popular weekends routes for cyclists. South of the intersection where these roads meet, Country Club Drive crosses the Escondido Creek to arrive at the proposed site of a controversial new housing development, Harmony Grove Village South (HGVS). Although the plot of undeveloped land is only zoned for 25 homes, HGVS is planned as a 453 home subdivision. The development is backed by Colorado-based Real Capital Solutions, the real-estate firm of billionaire Marcel Arsenault who made a fortune during the 2008 housing crash. Per state law, the county created a General Plan seven years ago to accommodate the region’s projected population growth. This plan is a blueprint to guide where, and how much, new housing can be built in unincorporated areas like Harmony Grove. The General Plan steers future growth toward city centers and away from areas without adequate water, road and fire services. Arsenault and his team purchased the land knowing the General Plan only allowed for 25 houses, but are making a bet that the developer-friendly San Diego County Board of Supervisors will re-zone the land for their project. It’s a pretty good bet. The Board of Supervisor’s willingness to go along with the desires of housing developers is on full display this summer. The supervisors are expected to approve seven housing developments, totaling more than 10,000 units, and each far exceeds the number of homes allowed under current zoning laws. Each housing development will require an amendment to the General Plan. A law passed in 1984 aimed at maintaining the integrity of General Plans limits counties to four such amendments each year. In a brazen dismissal of the spirit of this law, the county is employing a legal loophole, a seldom-used provision that allows supervisors to “bundle” the developer applications. 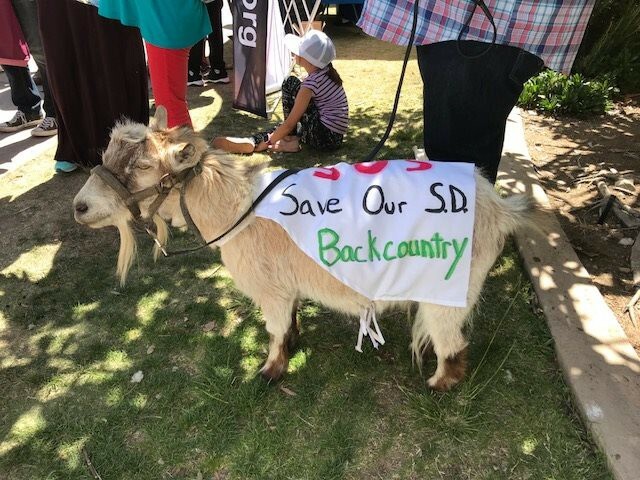 In response, county residents have started a voter ballot initiative to take away the Board of Supervisors ability to overrule the General Plan, giving this decision to San Diego voters instead. 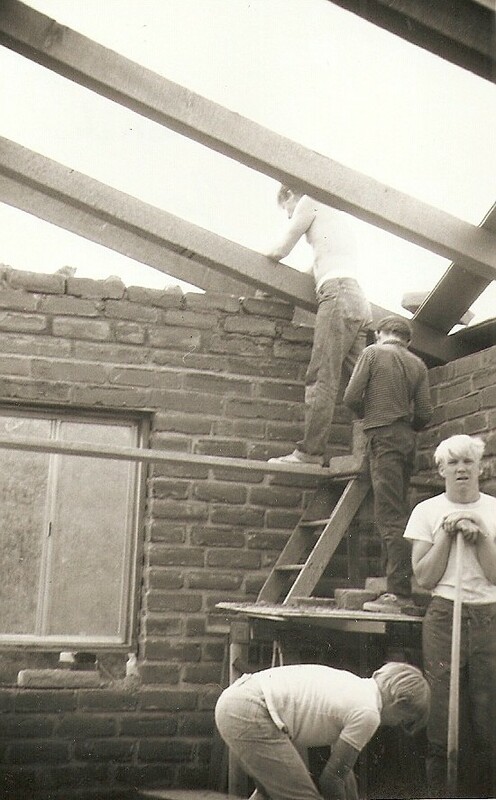 “Deep-pocketed developers present a false choice, that the only way to get a roof over every head is to build sprawl-style developments in the middle of the countryside, where they’ve purchased land on the cheap with the hope of building it up for a handsome profit. Of the half dozen (or more) development projects coming before the Board of Supervisors this year, this week’s hearing for HGVS is special. It includes an unprecedented fire code exception that dramatically increases the likelihood of residents becoming trapped during the next wildfire. View from of the Coco’s Fire from Harmony Grove. Credit: Eric Neubauer. Country Club Drive is a single access, two-lane winding country road that crosses the Escondido Creek and eventually dead-ends 1.7 miles from the creek crossing. Today, sixty homes rely on Country Club Drive as their only exit from the area. 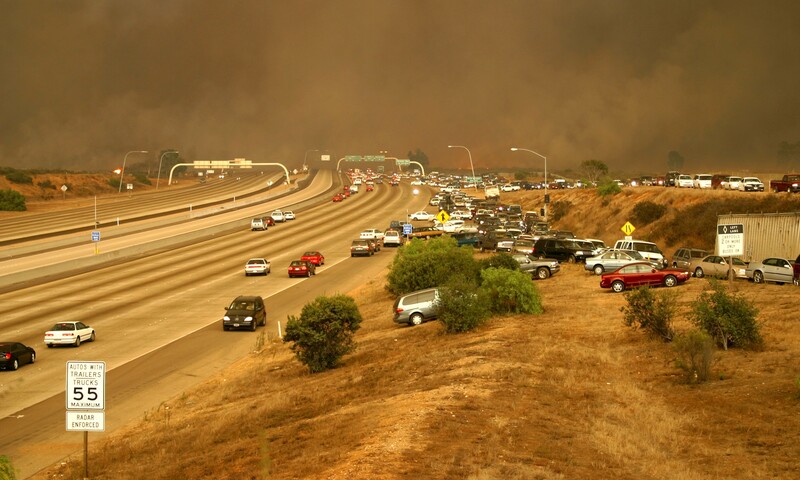 Considering the deadly consequences of becoming trapped during a wildfire, the County of San Diego Consolidated Fire Code and the California Code of Regulations sets maximum lengths for dead-end roads. By putting forward a plan of 453 units with parcels of less than 1 acre, the HGVS development is subject to a dead-end road length of 800 ft max. A second means of access is required if this maximum dead-end road length is exceeded. HGVS has a dead-end road of 4224ft, over 5 times the maximum allowed length and the developer has no plans for a secondary exit. For existing residents, like my family positioned towards the dead-end, they are an alarming 11x the recommended distance. So the question is, why isn’t the developer providing the required secondary evacuation route? 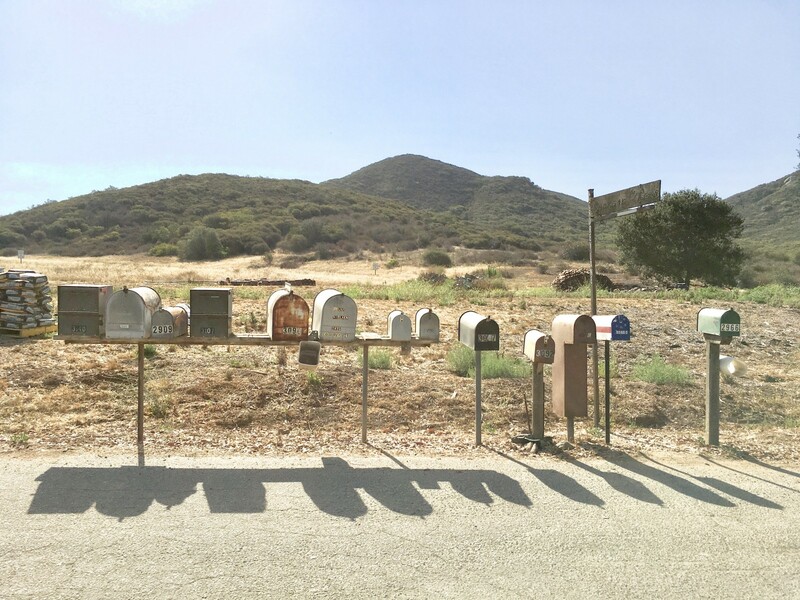 Mailbox row for some of the 60 homes that currently use Country Club Drive as their only means to escape during a wildfire. HGVS will place these residents behind an estimated 1500 additional vehicles during a fire. The developer of HGVS claims, “steep topography, wildland fuels, environmental issues, roadway distance to acceptable connections, and private ownership/easements” made a secondary exist infeasible. The fire code isn’t something you throw out because logistical or financial constraints made it inconvenient. The General Plan is the result of $18 million in taxpayer-funded studies and 13 years of work. The developer’s excuses for not meeting the bare minimum of fire safety are just proof that the General Plan correctly zoned the land in the first place. Environmentally the area is not meant for a large subdivision. But the developer wants the profit to be gained from forcing 453 homes into that space, without footing the bill for the corresponding additional infrastructure. In their Fire Protection Plan and HGVS Evacuation Plan, Arsenault and Real Capital Solutions have engaged in such fantasy planning. Their plans objectively do not increase safety but try to create the perception of safety by promoting the most benign wildfire scenarios and normalizing shelter-in-place. The plan begins by diluting the occurrence rate of fires in Harmony Grove, including data from before 1950, when fire records are spotty at best. The inclusion of unnamed fires from 1943 and 1919, conveniently skews the average number of years between fires from approx. 2 years to 7 years, minimizing the modern danger. Then the plan tries to address the lack of a fire code compliant secondary ingress/egress road. To receive an exception to the fire code the alternative measures must meet and/or exceed the secondary access requirement. The alternatives proposed by the developer are two-fold: (1) expand Country Club Drive to three lanes across the Escondido Creek and for the portion of the road in front of the proposed development, and (2) use fire-resistant building materials and landscape practices so trapped residents can shelter-in-place. Widening the existing two-lane road to three lanes is the crux of the developer’s argument. 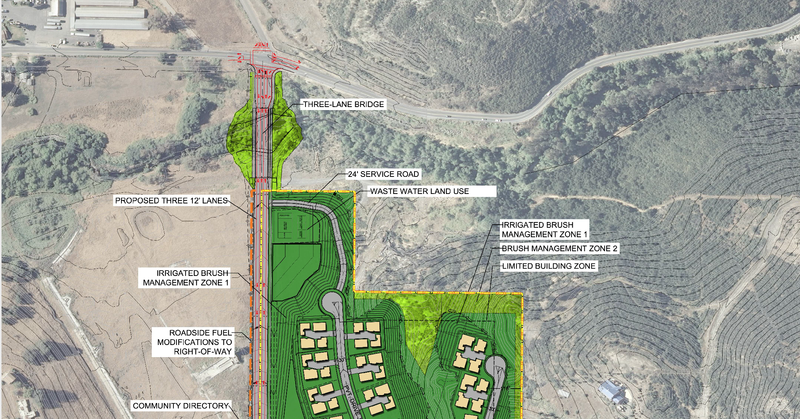 Since the intent of the relevant fire code is to ensure safe evacuation, the developer’s reasoning is that a three-lane road will allow for faster evacuation than a two-lane road. What’s interesting about this proposal is, if simply making the road into 3 lanes was all that is necessary to mitigate the danger, why didn’t Cal Fire write the code that way? Why doesn’t the regulation read, “except for when the dead-end road is 3 or more lanes”? They didn’t write the code that way because simply widening a section of the road does not address the limitations of only having a single way to enter or exit the community. A single exit that can become blocked by fire or vehicle collisions in a panicked evacuation. Evacuation takes 1.25 hours and a fire will take less than an hour to reach the development. After the three-land road, the fire protection plan moves to fire-resistant building and landscaping. This is referred to “as one layer of the fire protection system alternative measures for mitigating secondary access/long dead end road length constraints.” Implicit in this statement is that fire-resistant features mean HGVS won’t burn down and that residents staying home during a fire will be equally safe as the evacuation that would have been provided by the missing secondary exit. This is at odds with California’s Ready, Set, Go! policy and the events of California’s 2017 fire season. In the Tubbs fire, twenty-two people were killed and the fire decimated large swaths of Santa Rosa. In the Fountaingrove neighborhood, homeowner groups had spent heavily on protection measures to prepare for a wildfire. Like Harmony Grove, the neighborhood was located in a very high fire hazard severity zone. Santa Rosa imposed a series of code restrictions on home construction in Fountaingrove, requiring such things as safe roof materials, mesh screen over vents — to keep out wind-whipped embers — and fire-resistant construction of eaves. Still, almost 1,800 structures were destroyed in Fountaingrove, including a newly built $4 million fire station, Santa Rosa Fire Station 5. The station, opened only two years earlier, was designed to improve the department’s ability to respond to fire and medical calls in the area. In the aftermath of Ventura County’s Thomas Fire, inspectors found more than 90 percent of all the structures damaged or destroyed had fire-resistant roof construction, and roughly 80 percent had fire-resistant exterior siding. At least 45 percent had multi-paned windows and 43 percent had eave screens. 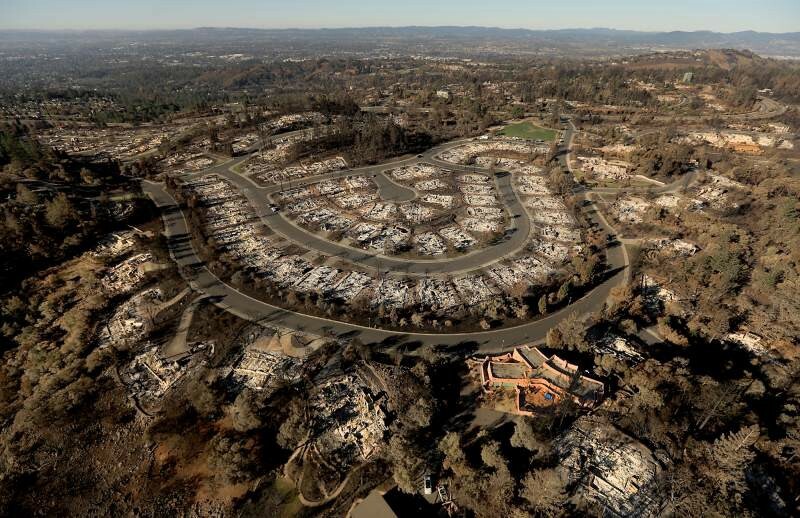 As evidenced by the destruction of the Thomas and Tubbs fires, fire-resistant features included in modern building codes do not make homes fire-proof. Still, the HGVS fire protection plan is banking on such building features to allow residents to shelter-in-place in the likelihood they won’t be able to evacuate. Shelter-in-place is a concept in the United States inspired by an official Australian policy, called Stay and Defend or Leave Early (SDLE). In the SDLE policy, the idea is that residents can use basic firefighting equipment, water and garden hoses, to put out small fires around their house caused by airborne embers. This policy came under intense scrutiny following the worst wildfires in Australian history, which occurred in the southern state of Victoria on February 7, 2009 — “Black Saturday.” Those fires killed 173 people, 113 of them in or near buildings. 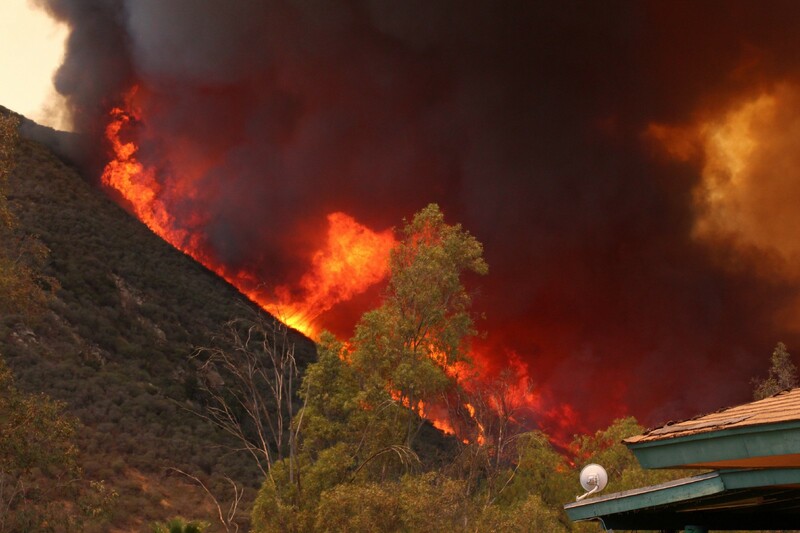 In the U.S., shelter-in-place is considered the last resort during a fire, used when high intensity wildfire threatens escape routes, denying residents an opportunity for escape. Despite the problematic history of shelter-in-place policies, it‘s in the developer’s interest to position this controversial policy as a mainstream strategy for a fire plan. Existing residents are all but forgotten in the developer’s shelter-in-place plan. Most of the existing Harmony Grove homes were built decades before fire-resistant techniques were incorporated into building codes. The HGVS Wildfire Risk Analysis considers these ‘legacy homes’ as “un-defendable against critical fire behavior.” Yet because of the HGVS housing development’s impact on the ability to evacuate, they will be forced to attempt to weather a firestorm anyway. Fire Chief Tony Michel, who last week submitted his retirement notice to the board of the Rancho Santa Fe Fire Protection District (RSFFPD), is the local fire authority that signed off on the fire plan of HGVS. The fire code allows the local fire authority with jurisdiction to approve a modification that meets the intent and purpose of the code as long as the modification does not lessen health, life, and fire safety requirements. In the case of the fire regulations for dead-end roads, the state and county did not opt to write the code with wiggle room. 800ft maximum is very specific. (1) Project site is surrounded by large wildland areas with little existing or planned surrounding development. In a story by the Voice of San Diego, Max Moritz, a UC Berkeley fire ecologist, is cited as saying the relationship between wildfire and new development looks like a bell curve. With the first few projects in undeveloped areas, fire risk jumps exponentially. But if development continues, eliminating all of the flammable vegetation and bringing new firefighting resources to the area, the risk reaches a peak and eventually plummets. HGVS will never reach the other side of the bell curve because the site is surrounded by preserve land, and the so-called legacy homes, to the east, south, and west. (2) Project site is surrounded by steep slopes and significant topographical constraints that could intensify fire behavior or limit fire suppression operational flexibility. The proposed site for HGVS is surrounded on all sides, except to the immediate northwest, by a continuing series of hills and canyons, with approximately 20 ridgetops. The site topography is even one of the reasons the developer claims a second evacuation route can’t be built. Some might think Fire Chief Tony Michel’s approval of the exception shouldn’t be questioned. I answer — it is naive to believe that local fire officials are not effected by the political and economic forces that are driving the trend of unsafe land planning decisions in California. Current San Diego Board of Supervisors who are scheduled to vote on the HGVS housing development and the fate of existing residents on Wednesday July 25, 2018. Approval of HGV South will be decided on Wed. July 25th, along with the Valiano and Otay developments. Developers often cry NIMBYism (Not In My Backyard) when area residents oppose a housing project. It would be difficult to believe this is the case for Harmony Grove. In 2007, the Elfin Forest and Harmony Grove Town Council and San Dieguito Community Planning Group both gave their support to a major housing development project, Harmony Grove Village. This time around both the town council and San Dieguito planning group recommended the supervisors deny HGVS, with fire concerns a chief factor. Coffee and Science Friday enthusiast.